It has been 5 years since the pop music scene has been graced the sound that is known as Marina and the Diamonds. Diamondis, now at the ripe age of 29, is admist a lengthy, and ever so creative promotional campaign to release her third album “Froot”. 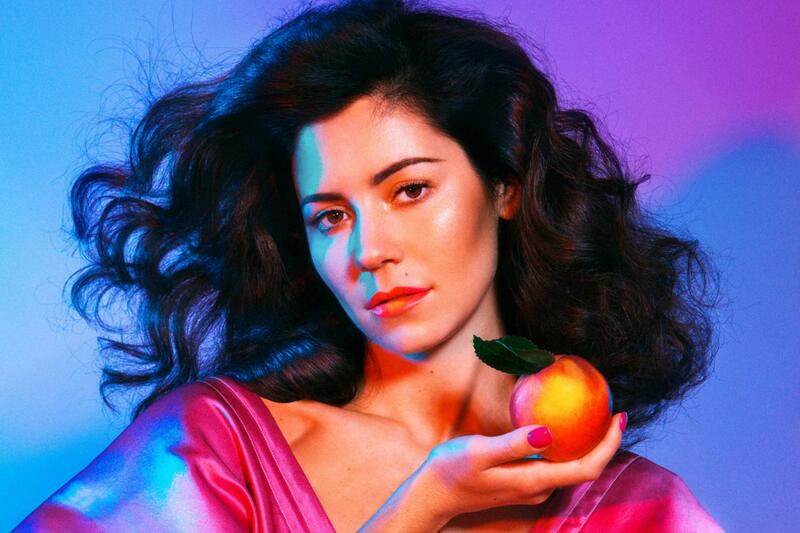 Back in October, on the singer’s 29th birthday she debuted the LP title track “Froot “, followed by the official release of the single, album art work, and track listing in November. Since the start of this era Marina has put the focus on the music and connection to her fans, commonly referred to as “the Diamonds”, giving us one delicious piece of her record branding them “The FROOT of the Month”. This type of approach to a release shows that Diamondis is here to bare her soul and take her diamonds on this journey of froot with her, the way she intended. “Electra Heart was so incredible in that it really changed the way that I wrote, and I don’t think I would’ve written this album if I hadn’t been through that process. I would be observing people like Diplo and Dr. Luke, and I found after that was writing in a much more free way, whereas when I was writing on my own with a piano I was really just stuck to it and I became quite limited, like I’d reached a certain point. I think it was down to the fact that they were giving me instrumentals to write on, and I was like “well I can make an instrumental…” so I started making these really shoddy ones at home and then found that completely and suddenly opened up my whole songwriting sphere in a really amazing way” -Diamondis on writing for “Froot”. The end result is a record that boasts themes of introspection, self awareness and personal growth as a human. Wrapped in the delicious sound of 70s/80s inspired pop synths and the live-band backed composition, “Froot” celebrates being happy in life while embracing the trials and darkness we all go through getting to that stage. To date, Marina has served up 5 pieces of her delectable “Froot”, each with either a music video or acoustic session of the the track all of which can be found on her official YouTube page Most recently Diamondis premiered here final piece of the “Froot” journey releasing the music video for the pop-rock driven track “Forget”. Among many high profile tour dates this summer, be sure to catch her as one of the headliners for this year’s 10th anniversary Osheaga Festival here in Montréal July 31-August 2. Be sure to grab yourself a copy of Marina and the Diamonds LP “FROOT” when it has it official release on March 13th (international) and March 16th (North America). Til then, pop on over to her social media pages and treat yourself to sweet, delectable flavors that is Marina and the Diamond’s “FROOT”. Bandsintown | Tips for your tours & tickets!